Laundry booking services is the high demand business in the leading industries; we are providing effortless solution start business growth with Laundry Booking Script. In the last three years Laundry booking services value increased to eight hundred million dollars, as per the survey. If you feel your housework get down, better feel up for the fortune that introduced Laundry Script for doorstep pickup and delivery that all your works get completes with our service. Our Laundry Service PHP Script is developed based on working for kind of business in a professional manner so that it is easy to mange through admin panel. 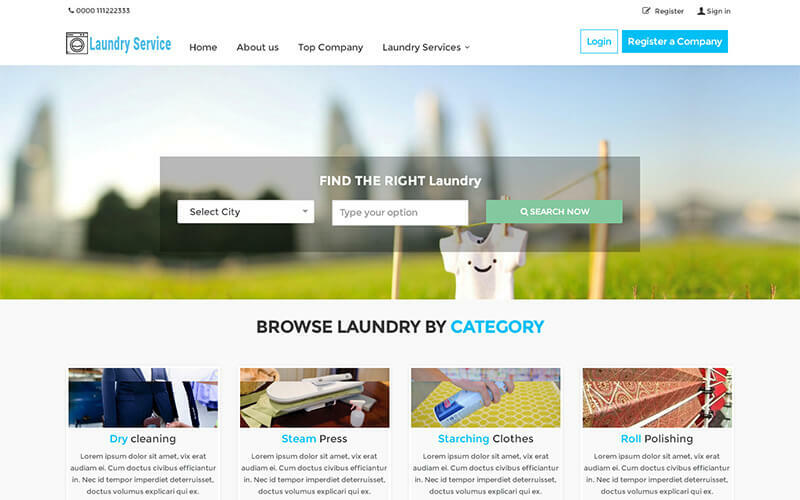 Highlights of Laundry Service PHP Script are order management, track bookings, doorstep pickup, ratings and reviews etc. Laundry Booking Script services include washes and fold, dry clean, iron and safety tips for your clothes for the future use. Laundry Script enables secure payment integration so there will be no issues on payment process. Laundry Business is on demand and increasing abruptly across the globe so don’t miss out the golden opportunity to start your individual Laundry Service PHP Script that cherish with minimum cost. Mobile responsive design, SEO-friendly structures our advance SEO- friendly coding style in accordance with Google standards. Basic and Advanced Search options, Laundry list with clear details, Top Laundry, Laundry Booking, Appointments management, Location Management, Category Management, Laundry Management, Review Management, Ad Management, User Feedback Management. I bought this Laundry Booking Script. This help me to stay connect with my customers and makes me beneficial. Happy for using this script. This Laundry Booking Script has excellent admin panel and profile management which acts as user-friendly for the clients. I bought this Laundry Booking Script. This help me to stay connect with my customers and makes me beneficial. Happy for using this script.